Just as Linda finishes the details on a new stand up desk, the Wall Street Journal publishes an article on the very subject. Are you reading this article sitting at your desk? How long have you been in your chair? 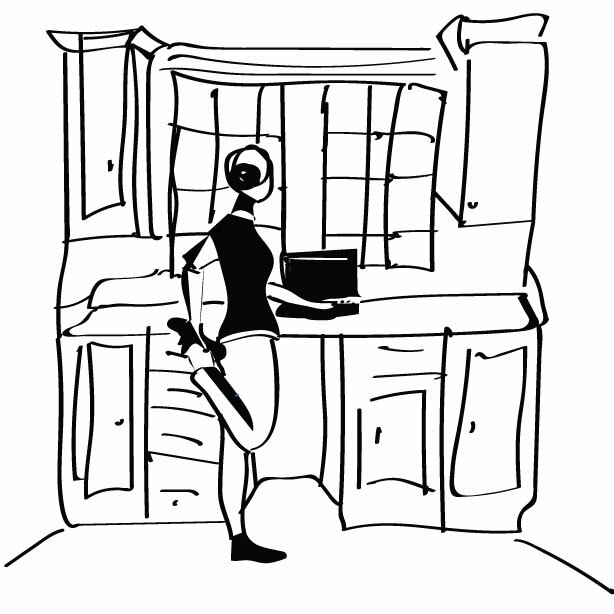 Even if you don’t make the jump to creating a desk, it might get you thinking about moving a bit more. The human body is designed to stand, not sit. Standing is better for the back than sitting. It strengthens leg muscles and improves balance. Linda works from home, and being closeted in a room did not appeal, so she decided to make her work station part of the living area. She wanted something that didn’t look too ultra modern. Ready-made stand-up desks were either way over budget or too big and bulky looking. And being an artist, she admits to enjoying the work of building things with her own hands. The step was to get a file cabinet, a needed accessory. She found a fantastic deal with a damaged floor model. Nicks are barely visible, and style looks great. Next was to decide on the counter top. The perfect economic and beautiful solution turned out to be from Ikea – butcher block counter top for only $60. When Linda went to pick it up, she found that it was damaged from being dropped on one end. It was not a problem to cut it down 6″, gaining a 30% discount. One coat of stain and 4 coats of poly, and it was ready. I hope this was inspirational – stand up for a while!